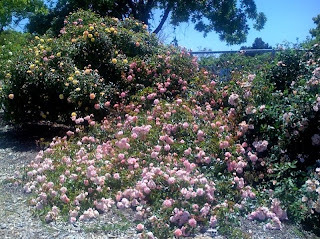 If you attempt to look up the pedigree of the David Austin roses of the past decade or so, that is what you'll see. As a "fellow explorer" in rose genetics, (No, I am not drawing any comparisons between myself and Mr. Austin) I find that rather annoying and disappointing. I'd like to know what went into the making of some of his current roses. Perhaps he is just protecting what he regards as "proprietary information", or maybe he just doesn't want us to know that he is using the likes of 'Fragrant Cloud' or (gawd forbid) 'Tropicana' to achieve his results. Who knows. I gravitate much more towards Ralph Moore's way of thinking about such matters. Allow me to paraphrase him: What have I got to lose by sharing information about parentage of my roses? You can see my "recipe" for a rose, but without my personal "ingredients", you can't make the same "cake". And besides, by the time a rose makes it to market, I've already moved ahead by six or eight years or more, and so why would I care if someone tried to duplicate my results? Makes sense to me. I'd rather describe in a fair bit of detail what I am working on and how I am getting there. Half the fun is getting pleasing results, the other half is sharing what I've learned in the process. And just because it doesn't feel right to write a blog post without a picture, we have today: 19-02-03 from a cross of 'Joycie' X 'Crepuscule'. Of course, I should have posted this video version of my rose photo book on YouTube in the first place, for its improved quality. It can be viewed full screen at 720HD if you wish, and you can pause the video if you want to read the text. I hope you like it. Happy Holidays! 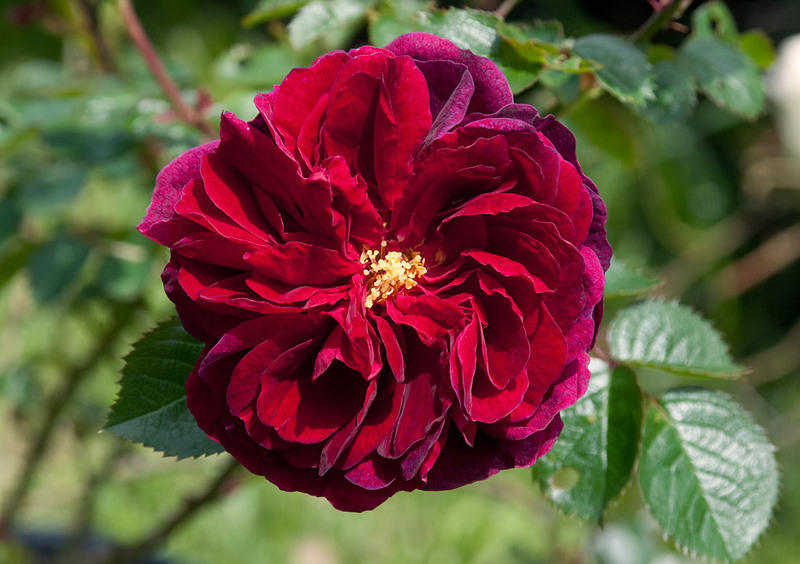 53-03-08: ('Tuscany Superb' X 'Othello') X 'The Yeoman'. As you can probably decipher from the code number of this one (cross #53, year 2003, seedling #8 of that cross) I have had this for several years now and I've been watching its performance in the garden. I made the cross hoping for a percentage of repeaters, and yet none of the dozen or so I kept for testing have been repeaters. 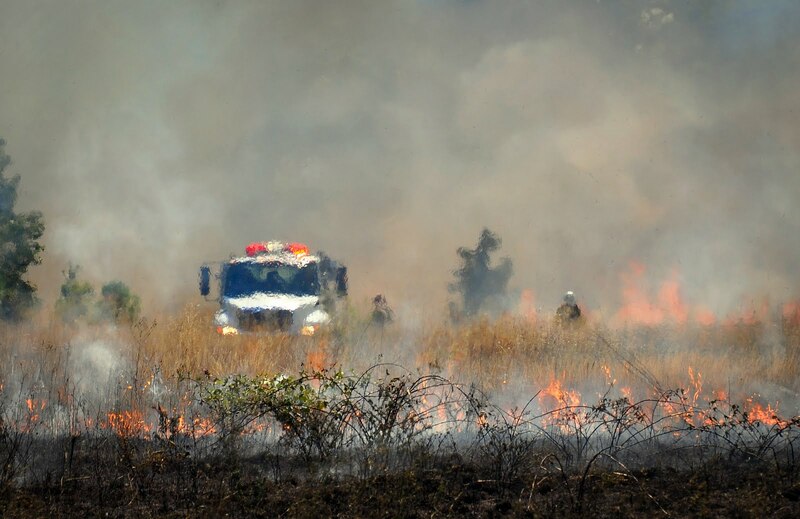 However, this one has other merits: it is totally Blackspot free (that is remarkable in this climate, where Blackspot rules) and is an aesthetic winner. It also bears a delicious fragrance, influenced by (but not a carbon copy replica of) its pollen parent, 'The Yeoman', whose Anise-scented blooms are anathema to some, and heaven-on-earth to others. I have started propagating 53-03-08 and have sent a few plants out for testing on other regions. 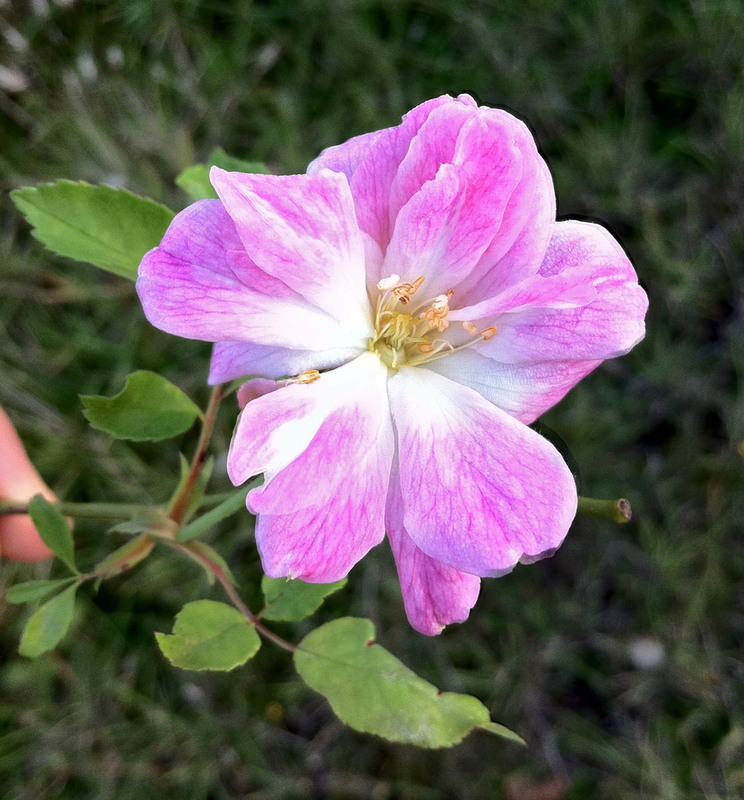 I don't exactly plan on releasing this commercially; I mean, do we really need more once-blooming pink roses? 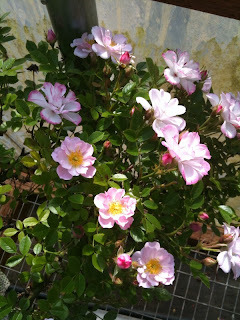 (Obviously rhetorical: my answer is no) Still, it is a lovely, easy to care for shrub. It appears to max out at about 7 feet tall and a bit wider, with an arching outline and no inclination to sucker widely. 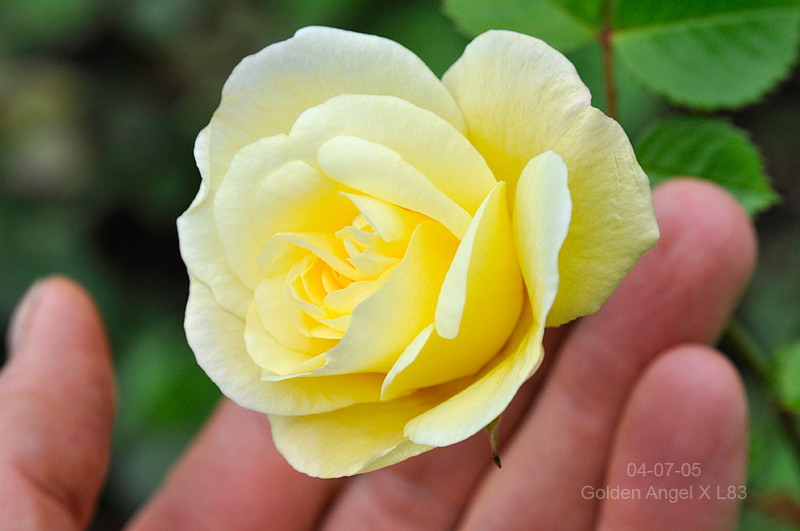 43-09-02: 'Golden Glow' X 'Morden Sunrise'. 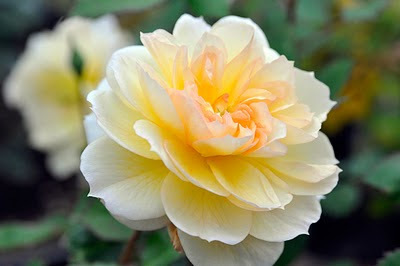 The idea here is improved winter hardiness in the yellow color range. Both parents are renowned for their ability to thrive in harsh, wintry climates, and so I hope to see some of that persist in this cross. At this point only two seedlings remain, and this is the nicer one of the two. 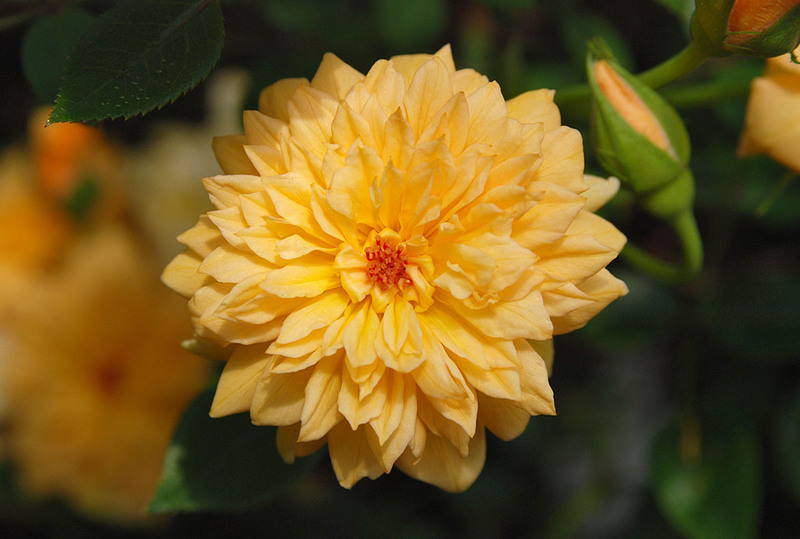 Curiously, it has inherited the peculiar Cinnamon-like fragrance of its Canadian parent, 'Morden Sunrise'. I have so many photos I have to organize, its not funny. 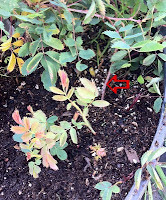 Most of it is documentation of the rose garden; seedlings and named varieties. I found this image from '08, illustrating my oldest specimen of 'Joyce Barden' my first commercial introduction from 1999. Seedling # 03-06-07: 'Hot Cocoa' X 'Dragon's Blood'. Few seeds from this cross germinated, and this is the sole survivor of the lot. I can't quite make the photograph reflect the subtleties of hue that the bloom actually possesses; its not just a red, its that odd shade of Chinese red with an overlay of "smoke bush" purple that several of the "brown" roses has. Not even Photoshop can tweak it to accuracy. Oh well. So, why the title of this post? Because I have been watching this seedling for three years now (pollinated in 2006, germinated in April of 2007) and I've been hoping it might eventually show some vigor and enthusiasm. It hasn't. It has never exceeded 18" tall and prefers to flower rather than build infrastructure. 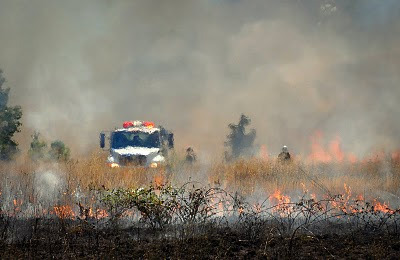 It also tends to die back rather badly even in our mild winters. I can just hear what you're thinking: maybe it just needs to be budded onto stronger roots? 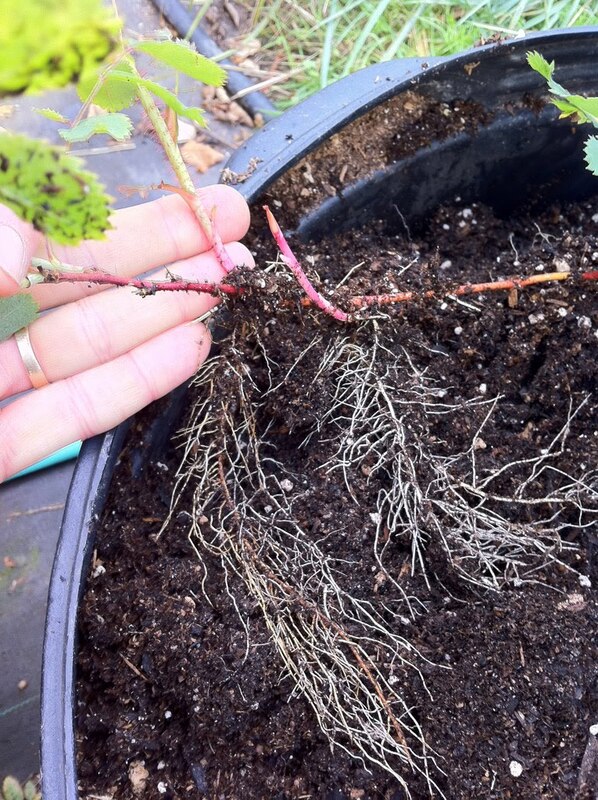 Well, yes....odds are that would improve its performance, but Since the rose industry is in such trouble now, I am insisting that any of my selections have to prosper on their own roots. Bud grafting just isn't an option anymore. 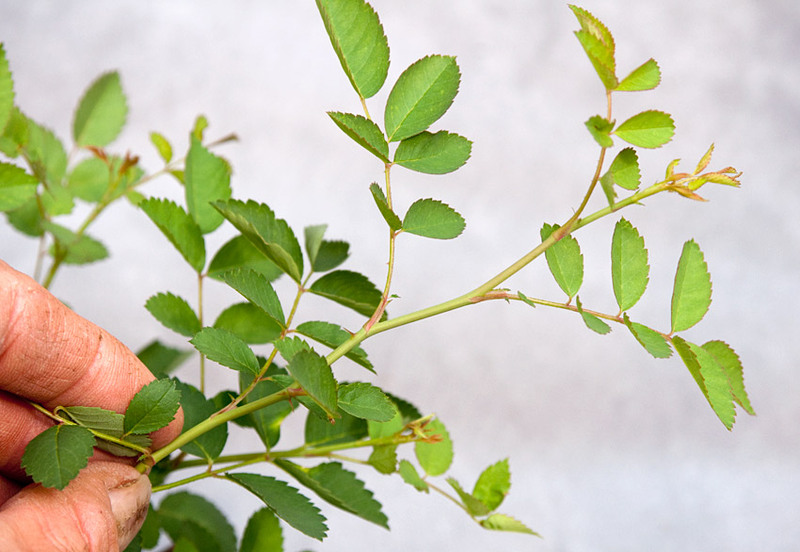 Distribution of new cultivars may soon be the job of the many small "boutique" and home-grown nurseries, and few (if any) of those nurseries are going to have the ability or the willpower to propagate by bud grafting; it will all fall to propagation by cuttings. I need to pay attention to that, and assume that is where the future of commercial roses lies. 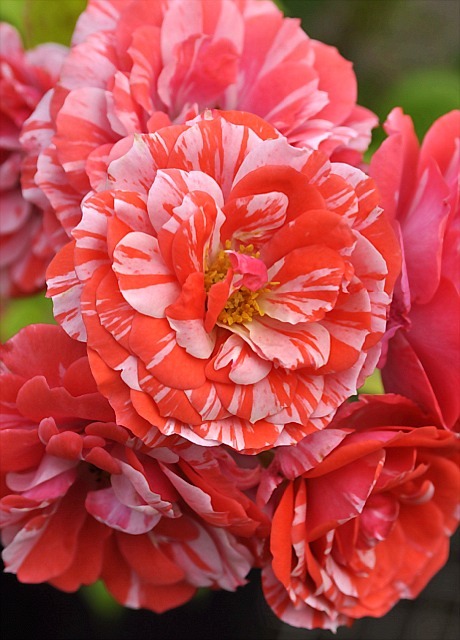 Anyway, it is a remarkable flower when it is doing well, with its 'Pat Austin' shaped cupped blooms and its muted cinnabar hued petals. Its just a shame the damn thing doesn't grow worth a hoot. Maybe it has something to offer as a pollen parent, maybe I'll give that a try next Spring. Just a quick note this morning before I get busy with chores. I've grown Ralph Moore's "Orange Moss" ('Mark Sullivan' X 'Golden Moss') for quite a few years and I have come to love it for the many things it is, and lament it for the many things it is not. 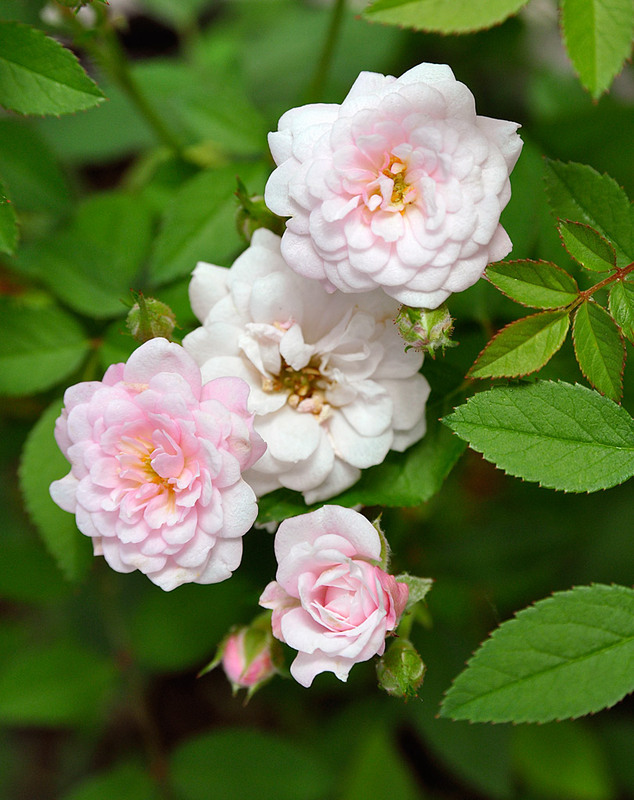 It is a remarkable leap forward in the breeding of the modern moss roses, something Ralph pioneered in the fifties. 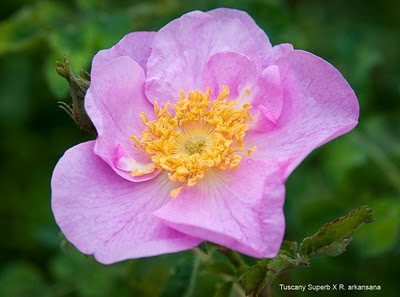 It is also deeply flawed, with its awkward, sprawling growth habit, sparse blooming habit, and insistence on producing an expert crop of mildewed growth from August onwards. 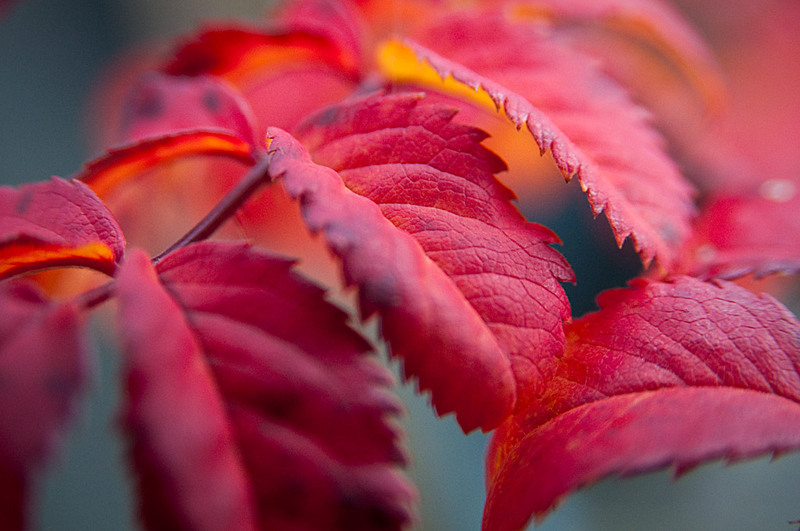 And yet, when it does flower, the buds with their rich orange hues splashed with a smoldering red are remarkable. The open blooms are pure joy; glowing pure color and striking anthers beautifully displayed, plus it bears the richest fragrance, reminiscent of Orange Tang drink mix from my childhood! 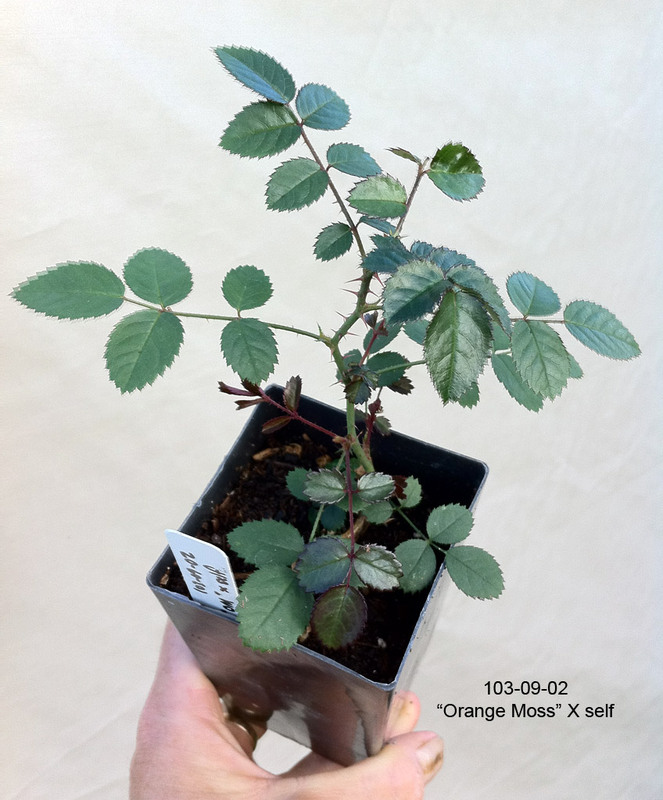 Ralph told me personally, and documented it in writing also, that Orange Moss, while enthusiastically fertile as a pollen parent, did not set seeds. 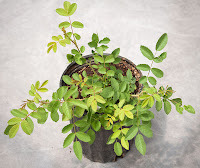 Perhaps it is a climate difference, but one of my greenhouse-kept specimens of it produced three hips in 2009. I did indeed save them and prepared the seeds along with all the rest of the 2009 crop, sowing them in March of this year. Three seedlings resulted, one of which you see here. Two of the three were dreadfully mildewy creatures, barely holding on to life all Summer. 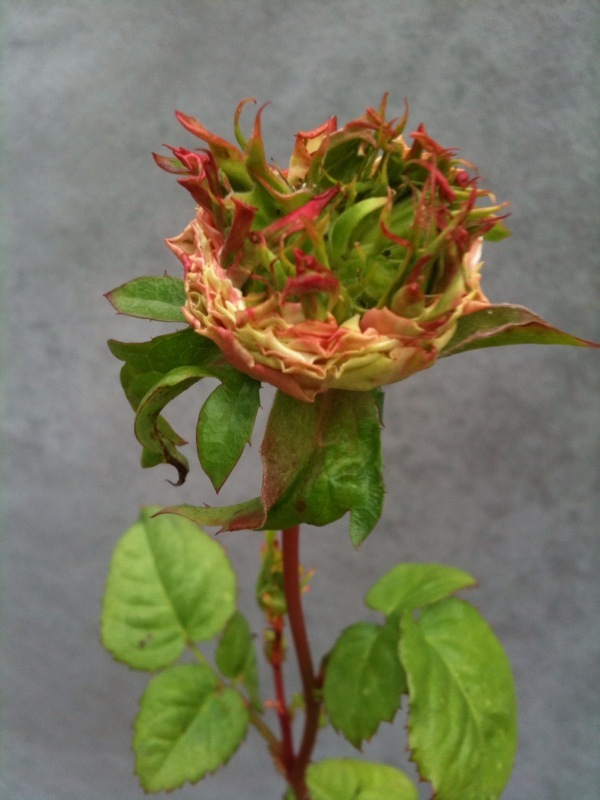 One appears to be declining, while the second is holding on, even while consumed by Mildew. The third one, as you can see, is clean as can be, with deep green glossy foliage. I am potting this one up into a gallon can this AM, and with any luck I will see a flower next Spring. I hope that it might contain the genes for both mossing and the rich coloring of its parent. Remontancy is unlikely, I'm guessing, but who knows. Doesn't that foliage just scream "I'm a goer!"? 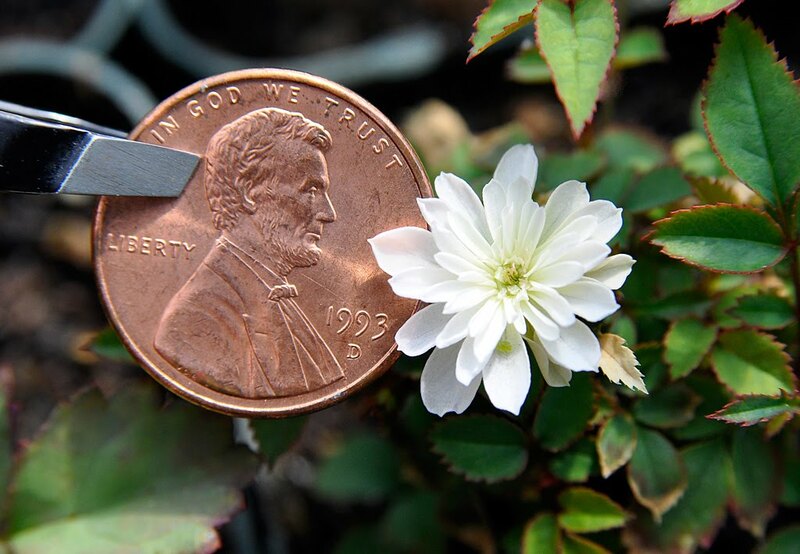 The seedling pictured here is one selection from a group of about twenty of this cross, germinated in March 2010. What isn't immediately apparent from the photo is the size of the plant; the container it is in is a five gallon "egg can" style nursery pot, with a lip diameter of about 14". 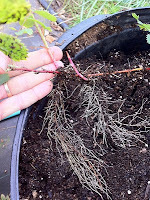 The seedling itself is over 2.5 feet tall and has branched numerous times from the base. Already it is building an attractive architecture and displays a full compliment of foliage that persists to the base. Most of its siblings are also showing signs of vigor, health and attractive architecture. This is the kind of thing I like to see in my work nowadays, and this is much more the direction my work is taking; a lot of native species involvement and heavy use of plants like 'Therese Bugnet'. (which I am beginning to regard as a superb shrub. Now all we need is to improve in the rate of rebloom) No, I haven't seen bloom on any of these hybrids yet, but I didn't expect to till 2011 anyway. Many of these near-species crosses take at least a full year to start blooming anyway. I also have a group of about 20 selections of R. foliolosa X 'Therese Bugnet' that are very similar in habit, but with even greater vigor, and in general, larger spaces between internodes. The R. foliolosa X 'Therese Bugnet' seedlings are also very sparingly thorned, some nearly thornless, in fact. I am looking forward to seeing first bloom on these in the Spring! Plus all of the Gallicas, with the exception of those that show conspicuous China or Hybrid Perpetual influence: these get some disease, often Mildew as well. I include all of the North American species I grow as well. My R. clinophylla, two plants seed grown, from India, both suffer some Blackspot infection, although minimal. 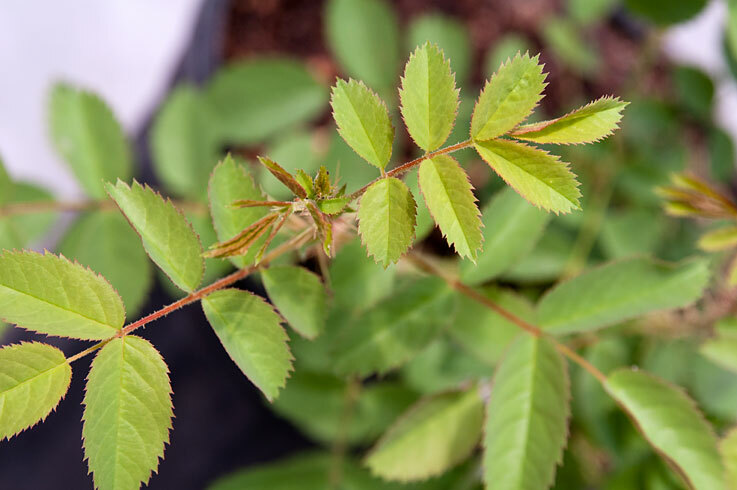 List 2: Varieties that kept at least 75% of their foliage in spite of infection, and which outgrew disease quickly, with little impact on overall plant health. I'm sure I have missed a few plants in compiling this list, which is easy to do when surveying a collection of over 2500 varieties. I'll remind readers that this list in no way in meant to indicate that all of these roses will perform similarly in all climates and in all sites/soil conditions. I know for a fact that some of the historic (OGR) varieties I list as highly disease free fare quite poorly in other regions. Still, it should at least provide some insight as to general health of the varieties listed. 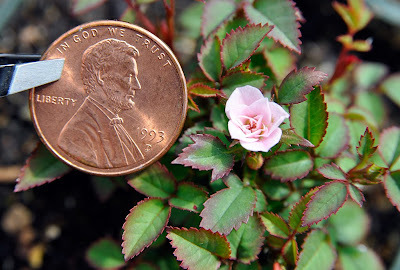 *One exception to this is the Ralph Moore collection, which is one of only two or three complete collections of commercially released Moore roses to be seen anywhere. As the curator of such a collection I feel the need to continue spraying these to keep them in good health, as I have only one specimen each of the majority of these. Labels: Blackspot, disease resistance, list. 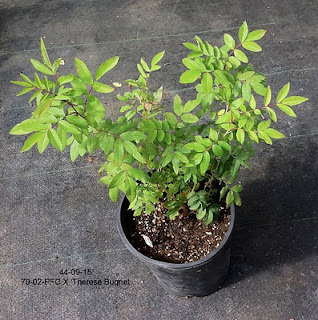 The seedling pictured above, a cross of 'Anytime' X 'Shadow Dancer', was gifted to me about 6 years ago by Ralph personally, as he was considering it as a commercial introduction and was seeking more feedback about its performance. 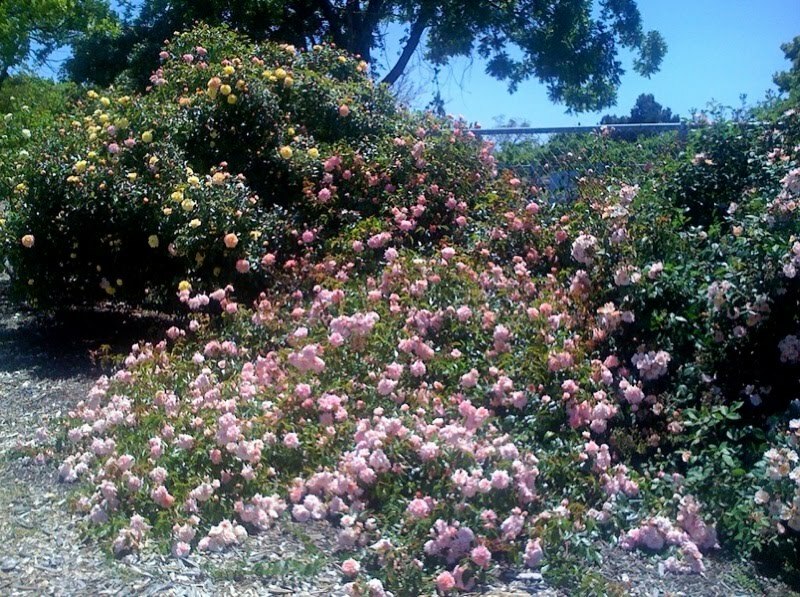 (In Visalia, apparently, it grows as a climber, but here in my climate it has not exceeded four feet.) You can see the 'Anytime' coloring it its blooms, right down to the curious lavender cast often seen in the center of the aging blooms. It is generous with blooms and often flowers in clusters of 7 or more, making for quite a display. It has no fragrance (not surprising, considering its pedigree) but has decent foliage health and good vigor. 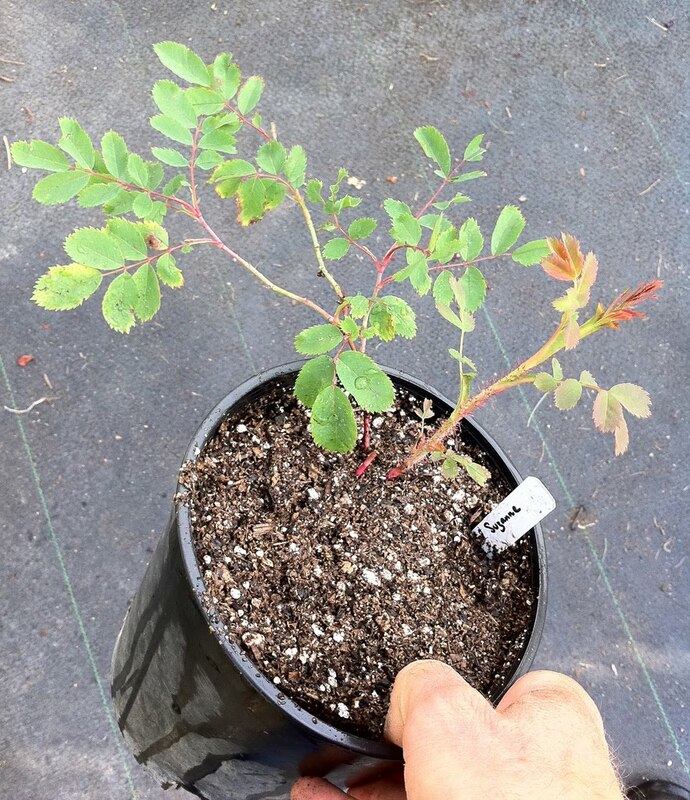 Unfortunately this seedling never did make it into commerce while Ralph was alive, but with Texas A&M now managing the vast Moore collection of un-introduced seedlings, it might yet have its day in commerce. For now, I will experiment with it as a breeding plant. 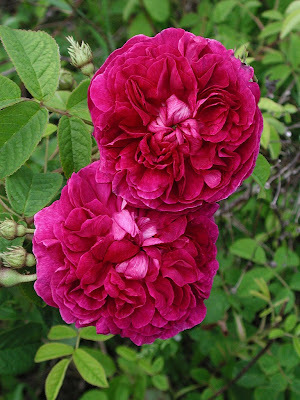 My first tests indicate that it is quite willing to pass on those striking 'Ferdinand Pichard' stripes that Ralph worked so hard to distill. 141-09-02: un-named diploid Polyantha X 'Home Run'. The rose used as a seed parent in this instance is a diploid Polyantha developed by David Zlesak and shared with me for breeding purposes. I don't have any record of its exact parentage, so I best not quote what I remember in case I'm wrong! 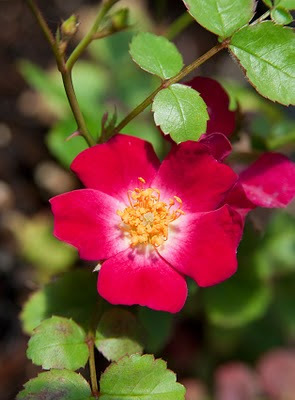 The Zlesak Poly is a cluster flowering dwarf plant halfway between a Polyantha and a modern miniature in style, with clusters of 2" double, cupped crimson blooms bearing a pale, near-white reverse. To my nose, it offers a very respectable "fresh" scent. 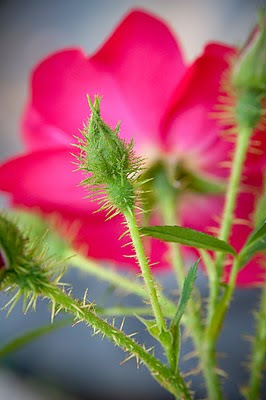 It is a very attractive little shrub and I hope David might consider it as a legitimate garden shrub of commercial value. I used the "Z Poly" last year in conjunction with a number of other diploids with the goal of maintaining a strongly pigmented diploid line. I also included Carruth's 'Home Run' in the list of pollen parents, as it is a triploid and will presumably give both haploid and diploid pollen grains, and so this cross, 141-09, should include a mix of diploid and triploid offspring. Every once in a while you get a pleasant surprise exactly when you don't expect it. 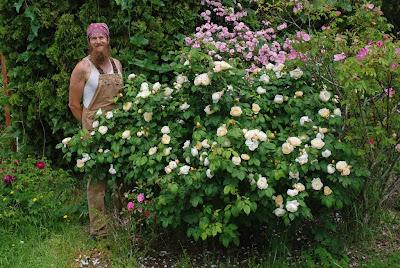 Last year, in an effort to concentrate more on developing a diploid breeding line with disease resistance, I collected a number of open pollinated seeds from 'Magic Wand' one of the well documented Moore breeders. 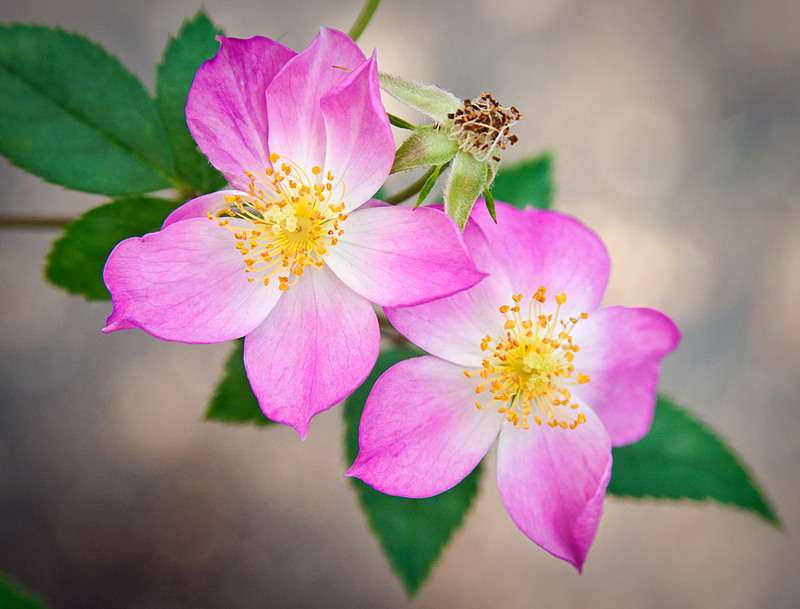 It is one of the first generation of "Zee" hybrids; a "climbing" shrub with very small foliage and large panicles of tiny, deep pink blooms. Although 'Magic Wand' is a tall growing cultivar, it frequently breeds very dwarf offspring, regardless of the stature of the other parent. 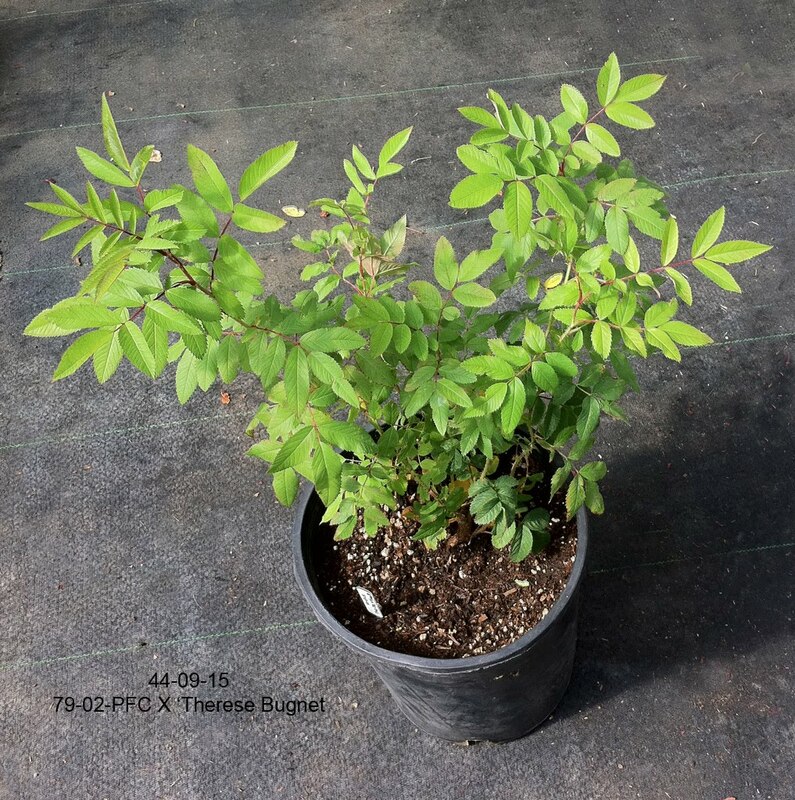 For me, it has potential value as a breeder because it is virtually indestructible in my climate, thriving with minimal care and resisting all three of the major fungal diseases without chemical assistance. And so, I grew a population of open pollinated seed to see what traits it had to offer. Mostly, I expected to see a range of characteristics, both dominants and recessives, but I didn't expect to keep any of the seedlings. The one pictured here was most noteworthy, with its well-formed blooms, spotless foliage, dense, bushy growth habit and balanced scale of all plant parts (tiny). It didn't hurt that the blooms are remarkably sweet-scented for such tiny flowers. (Blooms do not exceed 0.5" in diameter) So, I'm keeping this feller. I've struck a few cuttings already and it roots in a matter of days (+- 8 days), which is even better. Funny, isn't it, how these little gifts turn up in a body of work in the places you don't expect them. The surprise factor is probably what I enjoy most about the work I do. I imagine a lot of hybridizers feel the same way. 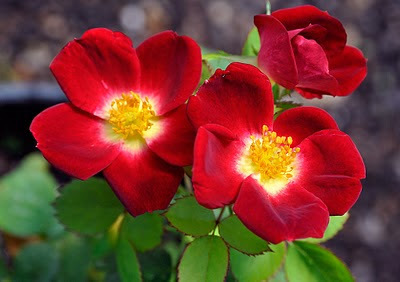 :-) Oh, and one more thing: I have given it a nickname for now; a reference to a rose it resembles: 'Si', by Pedro Dot. I'm calling it "Si Plus Plus". I wonder how many people will get that pun? 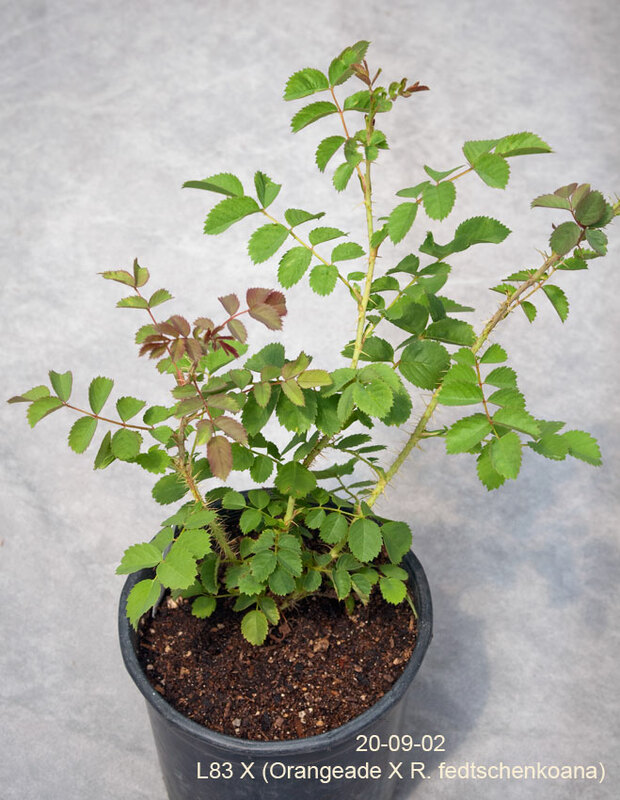 The seedling's foliage is fragrant when touched, giving off a combined scent of Frankincense and Raspberries! 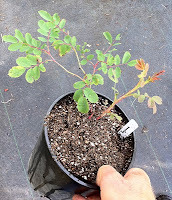 It is pretty clear that this one is going to be vigorous and a semi-climbing plant, whereas its sibling more closely resembles its R. foliolosa parent, remaining more shrubby. No flowers yet, but then I don't expect to see any till next Spring. There is always the possibility that this cross (I have two seedlings, this is just one) will not have fertility to breed another generation, but I have a hunch it will be. 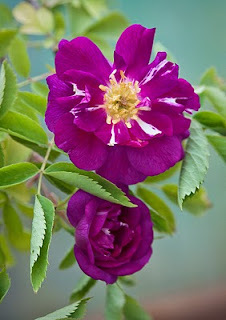 I have another hybrid that is a diploid breeder (42-03-02) out of Moore's 0-47-19 (R. wichurana X 'Floradora'), crossed with an R. rugosa hybrid, which will have the ability to pass on remontancy while remaining a diploid. I'm trying to avoid getting into triploid territory for now, just to make things easier to deal with. 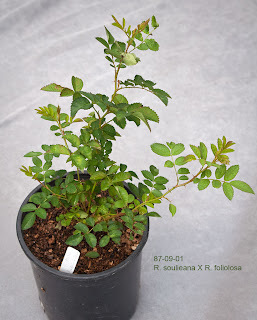 I will post photos of the 42-03-02 X R. rugosa seedling soon. 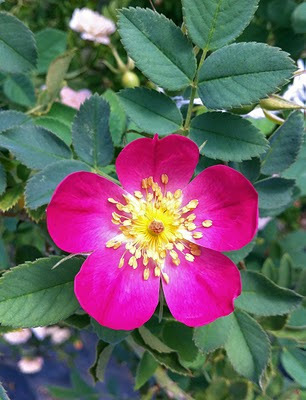 It shows considerable Rugosa influence in its foliage. I should be writing something substantial, meaningful, educational, but today I'm not in that frame of mind. 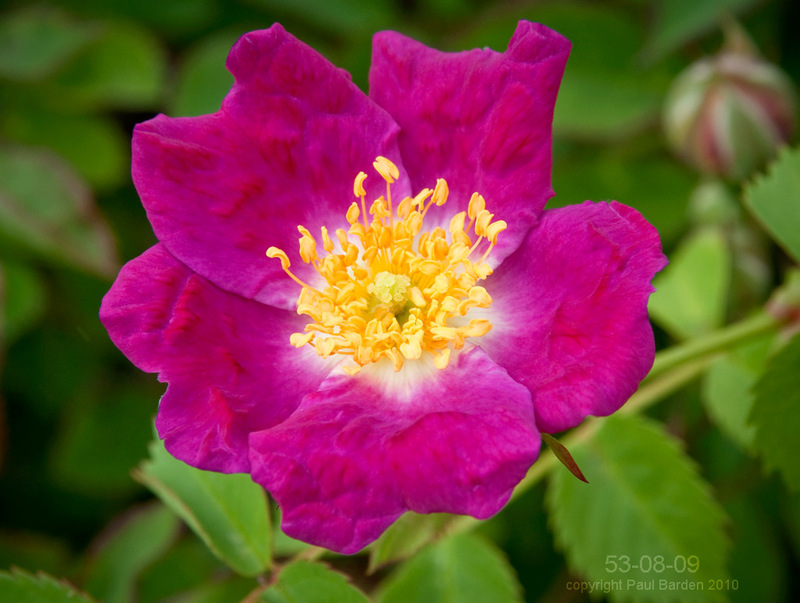 However, I will share with you today's new photo of my current favorite seedling: 53-08-09 ('Midnight Blue' X L83). This is a Kordesii hybrid and as such, it may exhibit both superior Winter hardiness and disease resistance. It's still very young, and only recently transitioned out into the garden, so these aspects of its nature are yet to be determined. In the meantime, I am going to admire its wonderful color (no photo I take does its hue justice: it is a much richer, more vibrant purple/magenta than it appears here) I have learned that it is remarkably easy to propagate as well, something many modern roses sorely lack. In June of 2009 I selected one of the local plants of R. pisocarpa to act as a pollen parent in a few crosses. R. pisocarpa is supposedly a diploid (14 chromosomes) which made it more attractive as a mate to some of my other diploid hybrids. 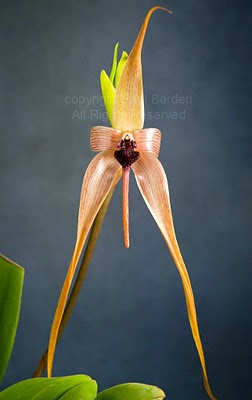 This particular clone was a particularly dark pink form, with a compact habit. This pollen served as the male parent of the seedling shown here. So, what is remarkable about this seedling? The fact that it is a repeat bloomer, flowering in its first year. Normally you would not obtain any repeat bloomers from a first generation cross with a native species, but it appears this R. pisocarpa has some secrets up its sleeve! Whether the plant has any merit as a garden shrub or as a stepping stone to better hybrids is yet to be determined, but this seedling makes me hopeful. 118-09-14 is still a fairly small plant in a gallon can, with canes no more than 14" long. The foliage, architecture and overall "feel" is intermediate between the two parents, but leaning a bit more towards R. pisocarpa in my opinion. The foliage has been very clean so far, but I reserve judgment until it has lived out in the test garden for a while. (With R. wichurana strongly represented in its pedigree, plus 1/2 R. pisocarpa, I'm hoping for good disease resistance) The blooms have a fairly strong powdery scent, not unlike 'Marie Pavie'. This shrub is an arching, large plant that appears to have much of 'William Baffin's habit, but possibly more lax. It isn't mature enough to know for sure how it will grow, but the clues are there. 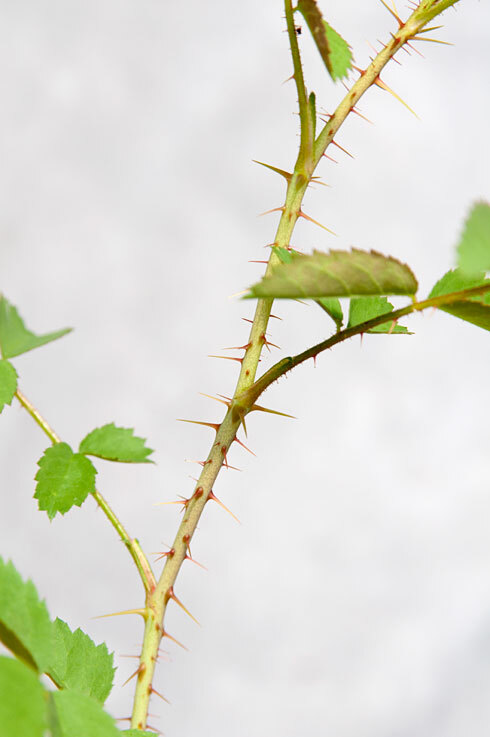 It is quite thorny, although the thorns are bent at the tips and not at all inclined to rip flesh, as some do. Blooms are 3" across, in clusters of five or more, about ten petals each and a clean, medium red as you can see. It is also obvious that the buds are decently mossy, a trait I expected to lose in this cross! If nothing else, this will find its way into the 2011 breeding schedule, to see what traits it passes along. It has set open pollinated seed freely and those will be germinated next Spring to evaluate the plant's potential. I was genuinely surprised to see these seeds germinate this Spring, and even as they grew I expected them to turn out to be selfs of L83. Now that they are a couple months old, its quite clear these are R. fedtschenkoana hybrids, with the matte bluish foliage that smells of Pine when rubbed. All three of these are remarkably intermediate in look between their parents. I can see distinct L83 qualities, and clear R. fedtschenkoana traits in all three. Of course, none of these has bloomed yet and I don't expect to see flowers until next Spring, but in terms of their pedigree, these represent potentially remarkable hybrids, unlike anything else before them. 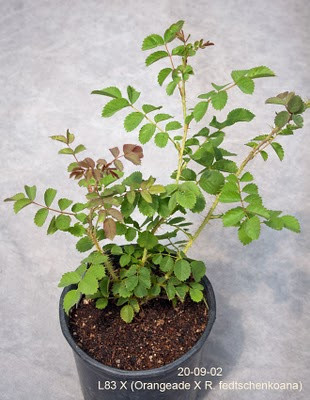 Shown here are a few images of all three plants, their overall appearance, foliage and thorns. 54-08-08 = 'Midnight Blue' X ('Orangeade' X R. fedtschenkoana) The pollen parent is a white semi-double rose bred by Kim Rupert, who generously donated a plant to my collection several years ago. This is a mightily vigorous seedling, having produced new basal growths recently that have grown from zero to three feet in only three weeks. I am pleased to note two things: 1) this plant has set seed easily using a variety of pollen parents, and 2) it is repeating bloom in flushes, where in its first year it did not bloom at all. One of its siblings has proven extremely easy to propagate and I will be testing this cultivar for ease of propagation soon as well. I think this has promise as a potential link to new kinds of shrubs for the modern, low-maintenance garden. This is the first time I have managed to collect enough pollen from my hybrid Gallica 'Marianne' to use for breeding. I am very excited to discover that, on 'Westerland' at least, the pollen is quite fertile. Hooray! Two years ago I gave up on Golden Glow as a breeder; it kept giving me whites and pinks and the occasional sickly pale yellow. I'm 2009 I acquired Morden Sunrise for breeding and decided to make one last try with Golden Glow, and mated these two. 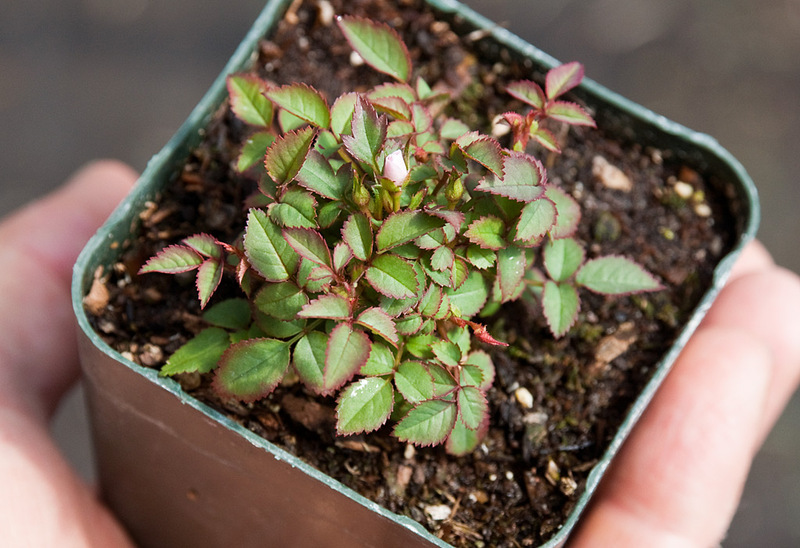 The seedling pictured here (43-09-02) is one of three that I kept. The other two are medium yellows. Although these seedlings may not offer anything in terms of Blackspot resistance, they may have superior Winter hardiness in cold climates. It is interesting to note that all of the remontant seedlings obtained from various Morden Sunrise crosses have that unusual Cinnamon/musk fragrance! At this point I am visualizing these selections as breeding specimens only, but who knows. Perhaps one or two of these will mature to have excellent garden-worthiness properties, in which case they may become candidates for release. I;ll post photos of some of the siblings as they mature. 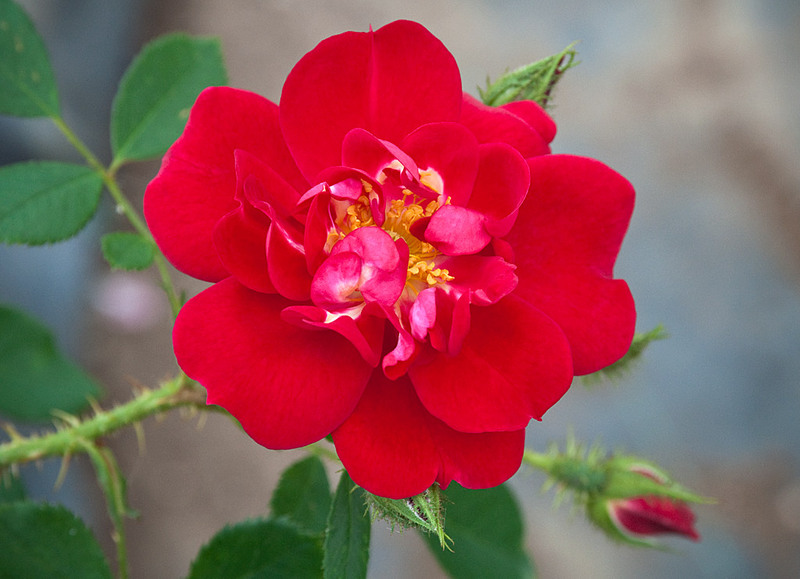 This cross was made with the goals of creating a breeding stock plant that was 1) a diploid, 2) well pigmented in the red range, 3) exhibited many of the R. wichurana traits such as disease resistance, attractive foliage, abundance of bloom and ease of propagation. 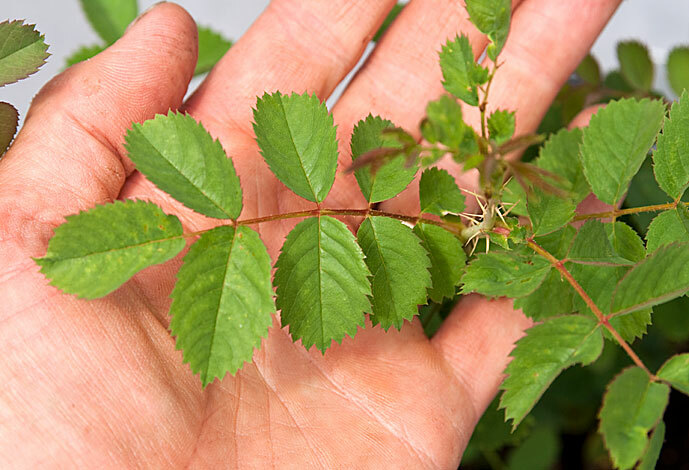 With any luck, some or all of these criteria will be found in this seedling, or one of its siblings. I cannot comment on the mature growth habit of the shrub. That is to be determined in the next 24 months. I list this as a diploid seedling since both parents are confirmed diploids. It is unlikely that it is anything but a diploid. I am so pleased when I read reports like this. 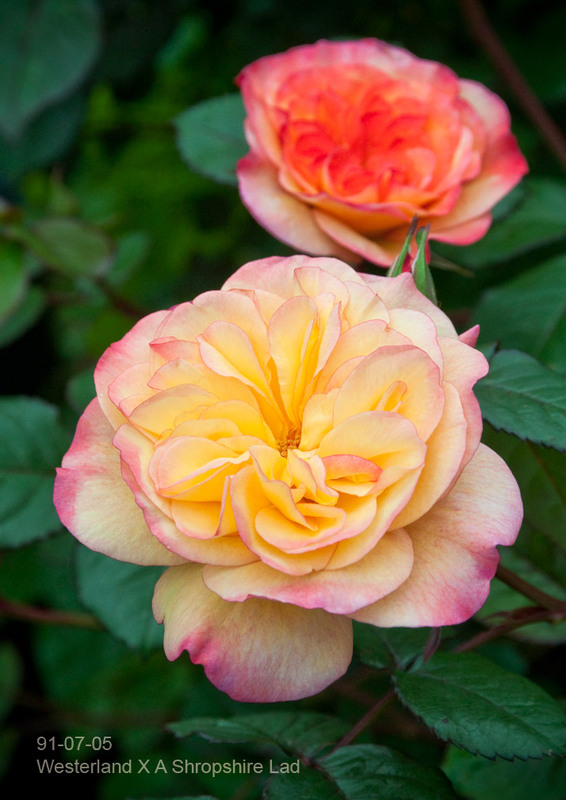 'Marianne' is one of my all time favorite once blooming roses, and I say that not because it came from my efforts as a breeder, but because it is truly such a fine rose and offers so much. 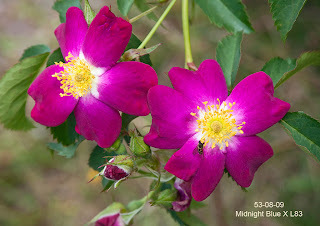 This year, for the first time, I have found and collected sufficient anthers from my two mother plants to be able to pollinate a good fifty or sixty blooms on a few roses. I have no idea whether or not the pollinations will result in seed production, its too soon to tell. 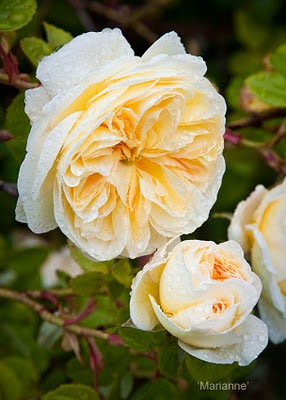 If I can obtain a rose as fine as 'Marianne' but with remontancy, I will be very pleased indeed. 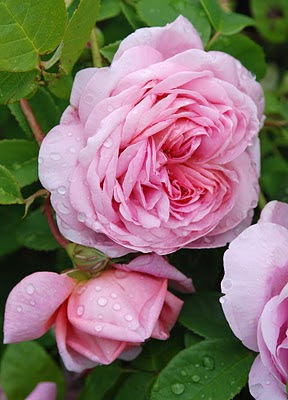 'Marianne' = 'Duchesse de Montebello' X 'Abraham Darby'. Registered 2001. 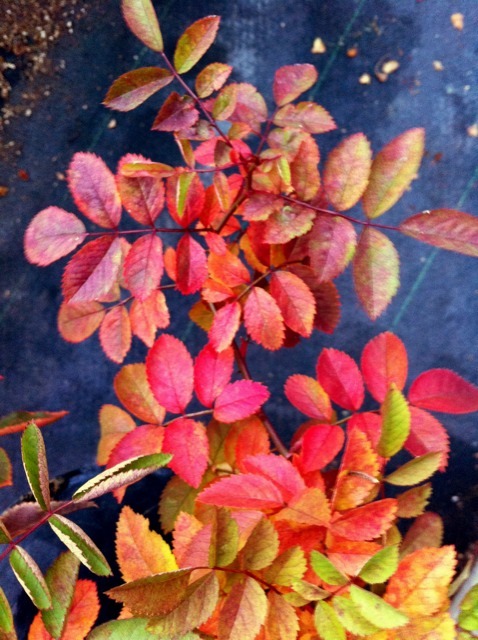 Available from Rogue Valley Roses.